"These are wonderful, chewy 'brownies' except that they are made with oatmeal instead of chocolate. Add your favorites (nuts, chocolate chips, chocolate candies, toffee chips) and create a truly delicious snack." 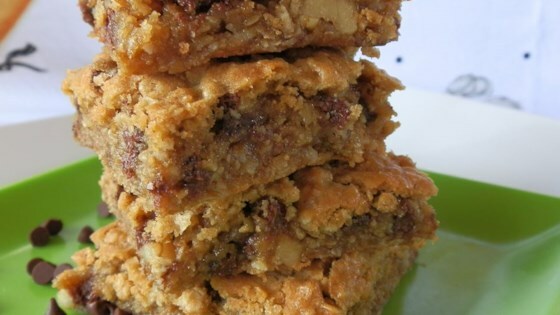 Easy jammy cookie bars are the best! They were okay. Even with semisweet chocolate chips and macadamia nuts they were a little bland. Maybe better with dried fruit pieces? the batter was great the cooked batch was better. They are great, i put chopped apple, craisins, chopped walnuts, and chopped banana, awsome!!!! These are simply delicious! They are sweet and chewy! I added chocolate chips and coconut. A real KEEPER for sure!